The Harrison C-75 polishing process combines mechanical and electrochemical polishing processes to produce exceptional surface finishes for stainless steels and nickel based alloys. The Harrison C-75 process was developed and is utilized by Harrison Electropolishing. The Harrison C-75 process was conceived in 1980. It was originally designed to meet the needs of the petrochemical industry. The Harrison C-75 electrochemical process delivers a smooth, cleanable surface, which reduces product adhesion and buildup. Through its development and implementation, a list of Harrison C-75 advantages has been cultivated and realized. Since the early 1980s, the Harrison C-75 electropolishing process has realized its place in a wide range of industrial and high purity applications. With its list of advantages and surface improvements, the Harrison C-75 electropolishing process has satisfied the most stringent requirements of today's industries and has been utilized overseas in five continents. 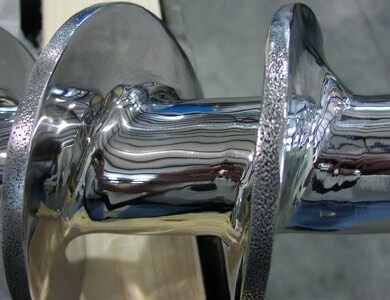 The Harrison C-75 polishing process begins with mechanical finishing. Harrison C-75 Electropolishing offers the highest quality precision mechanical polishing available in our industry. Our process development team understands the many industrial applications for precision polished parts and has developed proprietary processes and tools. Our unique process combines precision mechanical polishing techniques, the latest polishing equipment, several proprietary components and over 30 years of experience to deliver an exceptionally smooth surface finish required for the Harrison C-75 process. The second stage of the Harrison C-75 polishing process incorporates electrochemical polishing which is commonly referred to as electropolishing. Electropolishing is an electrochemical process by which surface material is removed by anodic dissolution. Electropolishing removes material starting with the high points within the microscopic surface texture. By removing these points, electrochemical polishing will improve the surface finish, leaving a smoother and more reflective surface.